The IABP has two main hemodynamic effects: during the diastolic phase of the cardiac cycle, a volume of blood is displaced to the proximal aorta following inflation; during the systolic phase, a vacuum effect is created in the proximal aorta following rapid deflation, thereby reducing the afterload experienced by the contracting left ventricle. To optimize these two hemodynamic effects, the IABP must inflate and deflate in synchrony to a patient's cardiac cycle. 3. an improvement in forward blood flow in patients with impaired cardiac contractile function. Modern intra-aortic balloon pumps now use a closed-loop control system to automatically optimize pump timing. The principal objective of balloon counterpulsation is to enhance the balance between myocardial oxygen consumption and supply. Several factors affect the achievement of a favorable balance: the volume of the balloon; its position in the aorta; the underlying heart rate and rhythm; the compliance of the aorta; lastly, the systemic vascular resistance. For instance, an increase in arterial elastance (a property which is affected by c﻿ompliance) is associated with a greater degree of hemodynamic improvement from an IABP. Despite the presence of multiple factors that can cause variability in the effects of an IABP; a majority of patients do exhibit a specific hemodynamic profile in the setting of cardiogenic shock (Table-1). 5. Elevation in the cardiac output by 20%. The reduction in aortic pressure, which is caused by the rapid deflation of the balloon, effectively decreases left ventricular afterload, and consequently diminishes myocardial workload. After-load (work against peripheral blood pressure) is significantly more costly in terms of myocardial oxygen consumption than cardiac output (work to deliver blood volume in intravascular compartment). Thus afterload reduction is the most beneficial aspect of balloon counterpulsation on a failing left ventricle. 2. 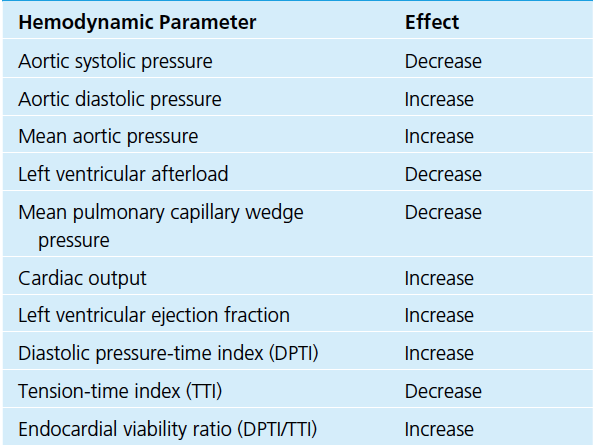 Diastolic pressure-time index (DPTI), which is the time integral of the proximal aortic pressures during diastole. Proper balloon inflation augments diastolic pressure (i.e., increases DPTI) whereas rapid balloon deflation decreases left ventricular afterload (i.e., decreases TTI). A ratio can be constructed from these two indices (DPTI: TTI ratio); this ratio has been termed the endocardial-viability ratio and illustrates the relationship between myocardial oxygen supply and demand. With IABP counterpulsation optimally synchronized to a patient's cardiac cycle, the endocardial viability ratio will increase.